Is the finger mightier than the voice? Microsoft released its Analog Keyboard Project, aimed at improving text input on the increasingly tiny touchscreens which are adorning the new wave of wearable devices. It's even built a protoype handwriting recognition keyboard for... wait for it... Android Wear. This allows you to respond to messages, search the web and perform other text input tasks directly from your wrist by just drawing the characters with your finger. 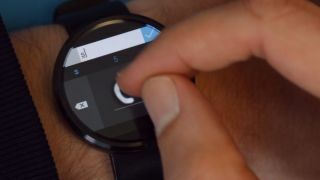 There's an example video showing the application in action (on both the square Samsung Gear Live and round Moto 360), and while input certainly isn't quick it does appear to work. If you fancy playing around with the prototype, Microsoft has made it available as a free download, but there are several limitations. Wearables with screen resolutions of 280 x 280 are not supported in this build, and all processing is currently done in the watch so it will drain the battery pretty quickly. We're interested to see how Microsoft develops this project, with scope for it to land in the likes of the Apple Watch and possible a variety of fitness and health trackers. Speak of which, have you check out our Apple Watch hands on review?